Why do things never seem to change no matter who we send to Washington? It seems like for decades many of us have been trying to change the direction of this country by engaging in the political process. But no matter how hard we try, the downward spiral of our nation just continues to accelerate. Just look at this latest spending deal. Even though the American people gave the Republicans control of the White House, the Senate and the House of Representatives, this deal very closely resembles “an Obama administration-era budget”. It increases spending even though we have already been adding more than a trillion dollars a year to the national debt, it specifically forbids the building of a border wall, it fully funds Planned Parenthood, and there are dozens of other concessions to the Democrats in it. As I previously warned, these “negotiations” were a political rout of epic proportions. Perhaps many of us were being highly unrealistic when we expected that Donald Trump could change things. Because fixing America is going to take a lot more than getting the right number of “red” or “blue” politicians to Washington. Rather, the truth is that the real problem lies in our hearts, and the corrupt politicians that currently represent us are simply a reflection of who we have become as a nation. 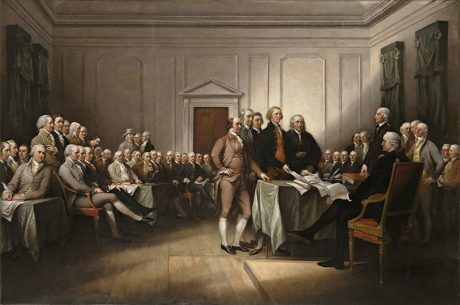 The generations of people that founded this nation and established it as the greatest republic that the world had ever seen had far different values than most Americans do today. So until there is a dramatic shift in how most of us see the world, it is quite likely that not much in Washington will change. 1. There are explicit restrictions to block the border wall. 2. Non-defense domestic spending will go up, despite the Trump team’s insistence he wouldn’t let that happen. 3. Barack Obama’s cancer moonshot is generously funded. 4. Trump fought to cut the Environmental Protection Agency by a third. The final deal trims its budget by just 1 percent, with no staff cuts. 5. He didn’t defund Planned Parenthood. 6. The president got less than half as much for the military as he said was necessary. 7. Democrats say they forced Republicans to withdraw more than 160 riders. 8. To keep negotiations moving, the White House already agreed last week to continue paying Obamacare subsidies. In essence, the Democrats got virtually everything that they wanted, and the Republicans got next to nothing. Trump and the Republicans are promising that they will fight harder “next time”, but we have already heard that empty promise from Republicans year after year going all the way back to 2011. Now, with control of all three branches and a president who sold himself in the primaries as the antithesis of weak-kneed Republicans who don’t know the first thing about tough negotiations, we are in the exact same position. Last night, President Trump signaled that, after not even fighting on refugee resettlement and Planned Parenthood, he would cave on the final budget issue – the funding of the border fence. But fear not, he’ll resume his demand … the next time! This degree of capitulation, with control of all three branches, is impressing even me … and I had low expectations of this president and this party. They have managed to get run over by a parked car. It’s truly breathtaking to contrast the performance of Democrats in the spring of 2009 with what Republicans have done today with all three branches. At this time in 2009, Democrats passed the bailouts, the stimulus, the first round of financial regulations, an equal pay bill, SCHIP expansion, and laid the groundwork for other, bigger proposals, such as cap and trade and Obamacare. Then they got everything they wanted in the March 2009 omnibus bill, and a number of GOP senators voted for it. We, on the other hand, are left with nothing. And even the mainstream media is admitting that the Democrats made out like bandits in this deal. If Trump can’t get his priorities funded now, do you think that the Democrats will somehow become more agreeable after he has spent a year or two in the White House? If there ever was going to be a border wall, it was going to happen now. If Planned Parenthood was ever going to be defunded, it was going to happen now. From this moment forward, the blood of every child that Planned Parenthood kills will be on the hands of every Republican that voted for this bill or that signed this bill. The next “big battle” is going to be over a bill to repeal and replace Obamacare, but the truth is that “Trumpcare” is going to end up looking very much like Obamacare. Instead of repealing it, the Republicans are trying to “fix” Obamacare, and that is kind of like going to the dump and trying to “fix” a big, steaming pile of garbage. But like I explained earlier, we should not expect things to move in a positive direction in Washington D.C. until the values of those representing us change. At this point, there are only a few dozen members of the House and a handful of members of the Senate that even give lip service to the values of our founders. And until our values change, we are not going to send representatives to Washington that share the values of our founders. Sadly, most Americans know very little about the history of early America. I would encourage everyone to look into why our founders came to this country in the first place, what they believed was most important in life, and how they viewed the world. If we ever want to “make America great again”, we need to return to those values. Otherwise, we are just blowing a lot of hot air. This article was posted in 2017, Commentary, Debt, Debts, Donald Trump, government shutdown, government spending, Government Spending 2017, National Debt, Obamacare, Obamacare Subsidies, political, Politics, President Trump, Spending Deal, Trump and tagged Government Debt, spending. Bookmark the permalink. Follow comments with the RSS feed for this post.Comments are closed, but you can leave a trackback: Trackback URL.